The course introduced referees to stricter fitness requirements as well as a renewed insight into the FIFA Laws of the Game under the instructorship of the FIFA Referee Assistance Program (RAP) team led by Massimo Raveino, the Referee Development Officer for the FIFA RAP in Oceania and including FIFA referee instructor, Neil Poloso and FIFA fitness instructor, Kader Touati. The participating referees also received copies of the 2010/11 FIFA Laws of the Game and multimedia training material developed and supplied by FIFA for referee instructors. 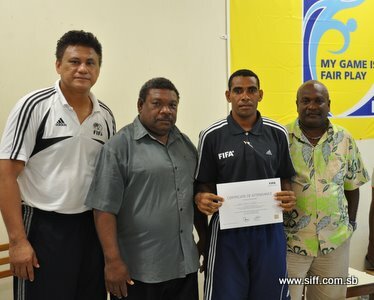 Raveino thanked the referees for participating in the course and called them to work together with the Solomon Islands Football Federation (SIFF) administration. “We are here to serve the interest of SIFF. We are not here for our private interests but we are here to develop refereeing and to develop coaching and football in general,” Raveino said. Course participant, John Sa’ohu said that the week has truly been fruitful for all the participants attending the training and they learned many things to help them in their career as referees. “We have truly gained a lot during this week from the course. We would like to thank the course instructors for their dedication in the delivery of this program,” Sa’ohu said when speaking on behalf of the participants. SIFF General Secretary, Eddie Ngava, joined the referees in congratulating the FIFA RAP team for their work. “This week I witnessed a very passionate delivery of the course content from the instructors and I am very pleased that our referees are in a position to benefit from the training provided by this energetic team,” Ngava said. SIFF Referee Development Officer, Justin Mutukera said that overall he is happy with how the course went but he acknowledged that certain areas have been highlighted in which local referees need to work hard on throughout next year. “Our referees need to improve on how they understand the laws of the game and also on their fitness. These will be areas my office will work on next year so that performance from our team members are at the expected standard,” Mutukera said. The FIFA follow-up refereeing course will be held again in November, 2011.